The Jack S has a welded stainless steel framework that sustains the aluminium skeleton of the stretcher and an efficient oil-pressured piston that allows a micrometrical height variation. The height variation is achieved by means of an ergonomic lever placed at the base and which conserves an excellent stability. 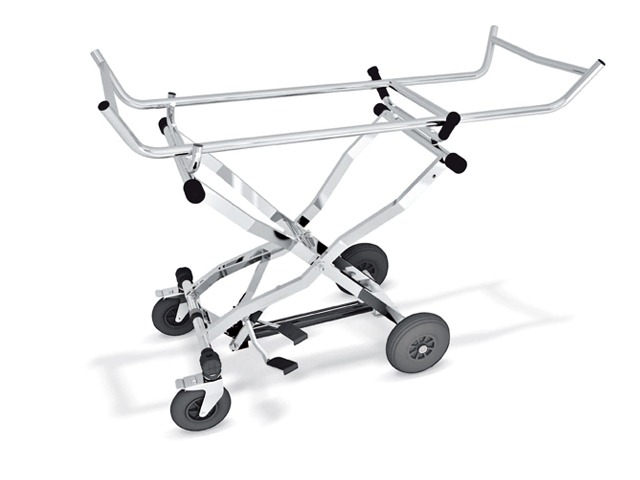 The Jack S is robust, light, easily stored and transported. Four large wheels, two of which are equipped with positioning brakes, allow it's use also as a method of transport on uneven terrain. The use of stainless steel and the essential manoeuvrability ensure an efficient sanitization. Thanks to a hardy structure, it can also be used for the lifting of heavy loads during field construction. Spencer is a leader in the production of emergency stretchers and thanks to the experience of those in emergency rescue or field hospitals who have made use of our products we are aware of the necessity to create special supports with variable heights which can be adapted to any model and brand of emergency stretcher.